This debate over Gov. Scott Walker’s budget bill has been difficult for me. I have progressive values. I believe in gay marriage, I believe in mass transit, I believe in global climate change, I believe in abortion rights, I believe in urban planning and I believe in a single payer health care system. But on the issue of public employee compensation and the role that their unions play in our government, I find myself siding with conservatives. Hands has been pretty brutal on the protesters as well as the Democrat Senators who bugged out of the state. 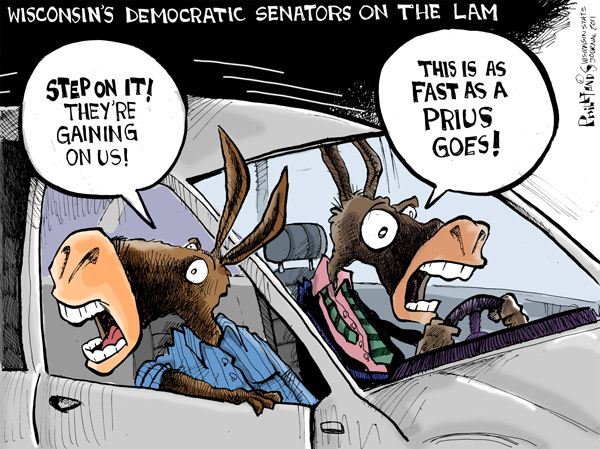 The fact that he’s dissing Democrats Senators as Prius drivers shows that even a liberal realizes that his ideological soul mates are mere caricatures. And he doesn’t much care for the extremism of the protesters either. He drew this based on an actual sign from the protest. 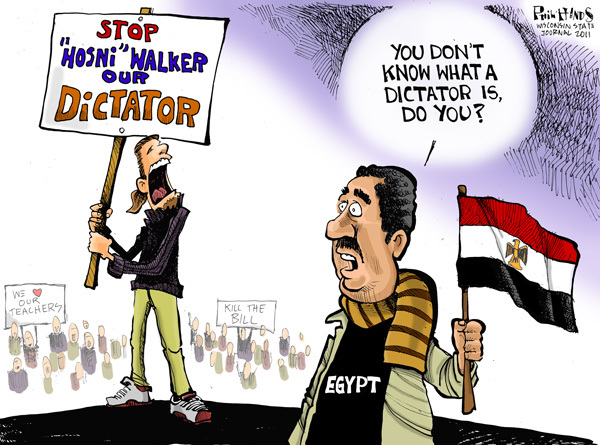 I’m sorry, but Walker is not a despot or a dictator. He, and the rest of the republican clowns serving at the State Capital were elected, by a wide margin, by the people of Wisconsin. I find it ironic that the same day that thousands of people skipped work to rail against our “undemocratic” leader, fewer than a quarter of the registered voters in Madison bothered to vote in an actual election. Protesters and Union brethren, you’re losing the argument and many of your usual allies are turning against you. Keep up the good work. Phil Hands says, “I believe in…”. Not I think, or I have concluded or any other phrase that indicates logic or rationality, but “I believe in…” Nothing characterizes a liberal democrat any better than this. Here is proof from a talented cartoonist that some Democrats are not totally brainwashed and can actually sort through personal experiences to actually learn. These are good political cartoons that reflect reality. I usually characterize the Left as “knowing everything while having figured out nothing”. Phil Hands is showing signs of figuring out something. Maybe there still is hope. If he figures this out he might even go on to actually think (rather than believe) about high speed rail, global climate change, abortion and a few other lefty tropes……Nawwww, never happen. Thanks. It’s my first direct Instalanche and it’s mind blowing. 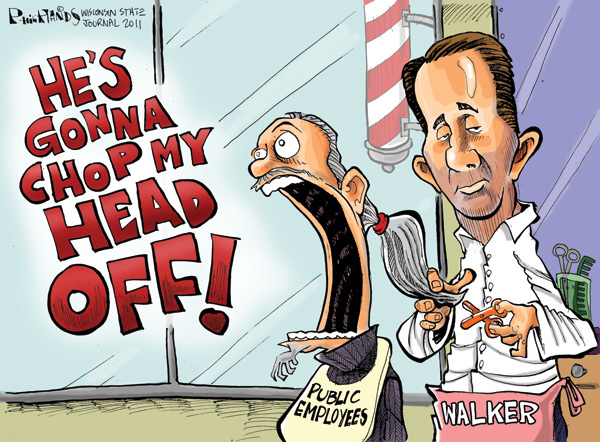 Bill Kristol wants Walker and Ryan on the top of the ticket for the GOP in 2012. On Wisconsin…! I’d put Ryan in as POTUS any day. Sanest guy in DC. Thanks to Phil Hands for his open-mindedness. Fantastic cartoons! Thank you for making me laugh today. My favorite is the one at the top of the page where the guy is afraid Walker will chop off his head with a safety scissors. LOL! Speaks volumes. KEN YA really trust these WI democrats? Interesting that you like that quote above. One could have easily said the following in November 2008 and later to the Tea Partiers: “I’m sorry, but Obama is not a despot or a dictator. He, and the rest of the Democrats serving in Congress were elected, by a wide margin, by the people of the USA. I find it ironic that thousands of people hold signs and rail against our “undemocratic” leader who absolutely throttled McCain in the election.” Losing an election is not tyranny. Glad you feel that way, Ben. I can’t wait for 2012. You are all one-sided morons who probably don’t have to deal with your collective bargaining rights being taken away. The drawings are also sub-par, lackluster and convey no originality to the art style. Way to impose mediocrity on the nation. BTW, maybe if teachers were paid better, you wouldn’t all have turned out this stupid. In your case, I would recommend a good art teacher. Enjoy losing 2012; this combined with you crazies trying to kill good ol’ GG, I’d say 2012 is a shoe-in for us Democrats. You lose. Breaking News: Wisconsin just passed the bill to restrict collective bargaining. The people have spoken.